ADP is best if you have a really knowledgeable client rep that has been your contact for multiple sessions. Otherwise, you are forced to reiterate the problems to multiple parties. If you have a dedicated staff member who is knowledgeable of your processes, then ADP is a good resource for payroll needs. ADP has an easy to read portal that is easy to navigate. The UI is fairly intuitive and as a user I can find the right information quickly. The ADP portal is flexible in the sense that we can change payroll amounts for special circumstances such as a special bonus or special payout. This allows our payroll team to make the necessary changes right away. The reporting capabilities are quite robust and there are many ways to customize reports that we use for finance, payroll, HR, etc. 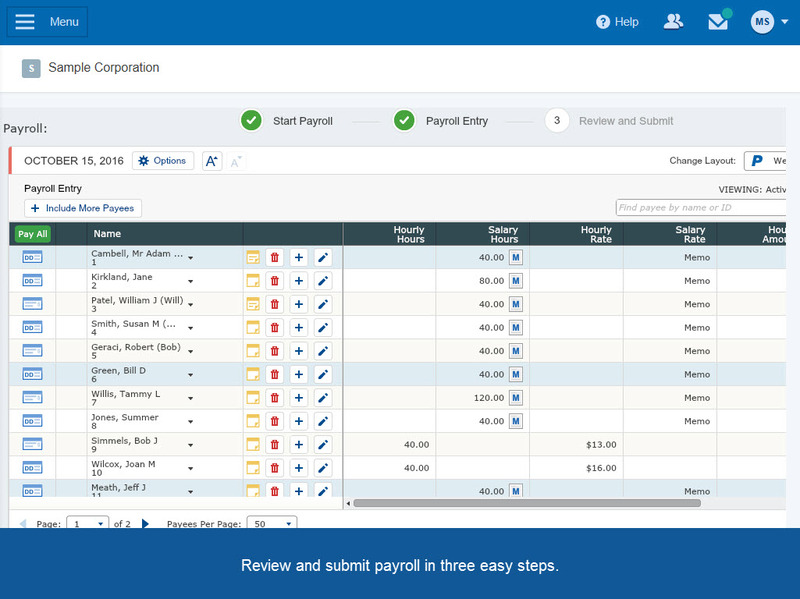 Before you submit payroll, you can run a report to easily check that you have entered everything correctly. This feature has been invaluable. Peace of mind when it comes to taxes. Paychex withholds all the appropriate taxes for both the employee and employer and then files them when the appropriate government entries. Our business is located in Ohio, which has a complex tax structure including both state and local taxes. Paychex has saved me so much time and stress. I have been impressed by the customer service. I have a dedicated payroll specialist who I can contact with any questions I have. She has always been very helpful any time I have had weird situations or questions. ADP organization has too many layers and you often have to speak to multiple people to find the right solution. There doesn't appear to be efficient communication between the internal teams at ADP - the left hand doesn't know what the right hand is doing. Thus, you often have to re-explain your issues. During the implementation of the software, it was not very coordinated. Some contacts were more knowledgeable than others and there was not uniform expertise. I wish that Paychex Flex tracked pay increases. That is the only thing that I liked better about our previous payroll provider. Our previous payroll provider had a tab that showed an employee's pay history and the date of each raise. I have a lot of experience and trust in this software package - actually any software package from ADP. The training that I have gotten over the years has always been complete and the representatives that I have had over the years are all EXCEPTIONAL! Looking back in the 20 plus years of experience, I can say truthfully there are only 1-3 persons who I would rather not have worked with at ADP. I find their customer service, and phone reps do their best to get the job done. This makes my job easier in the process. Before my time, Uyemura was using ADP Paynet Plus and switched to another software, who shall go unnamed, but it was a complete bust. The taxes were calculated incorrectly on employees who have a car allowance and of course this a very big area for mistakes. We quickly switched back to ADP Paynet plus. I have always used Paychex for my payroll processing. We currently use ADP Resource for payroll and some HR only. We have been approached for the 401k and insurance portion of ADP Resource but we have separate third party administrators for those. The customer service is outstanding. I would not change anything. I understand and agree that the employee's would benefit from viewing and making limited changes to their employee record and this will be approached in the next meeting we have with the president of the company. It has made things easier for me since I wear a lot of hats. It is a great outside resource for employees. It can be hard to get employees to initially sign up!